It has never before been more affordable and easier to have a Skype for Business meeting room experience. 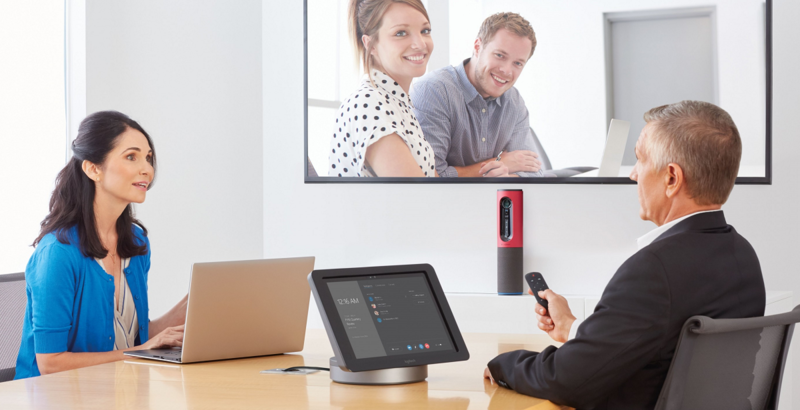 Microsoft’s game-changing Skype Room System (SRS) works beautifully with your existing video displays as well as audio devices and video cameras certified for Skype for Business, making it easy to launch a meeting with a single touch. Interested in a complementary one-on-one demo to learn more about the new Skype Room Systems? There are many audio and video device options compatible with the Next Generation Skype Room Systems (SRS). How do you determine which devices are best suited to your meeting space? The best place to start is with the size and layout of your meeting room. These factors, along with the number of in-room attendees, determine which devices you will need in order to conduct the most engaging and effective Skype for Business meetings. First, we’re going to take a look at all of the devices compatible with Skype Room Systems. Next, we’ll categorize them by the meeting room sizes they are designed for. Finally, we’ll give you some device combination ideas to help inspire you about the different meeting experiences you can create. For instance, the ability to seamlessly switch between multiple cameras within an ongoing meeting allows for more creative and productive expression. Let’s get started! The compatible devices can be split into three categories: speakerphones, cameras, and speakerphone/camera hybrids. Small, portable and powerful with wireless and Bluetooth Skype Certified Speakerphone. Powerful speakerphone with wireless and Bluetooth capabilities. Forget about echoes, background noise, and distortions. Small and portable plug-and-play speakerphone. Powerful speakerphone with exceptional audio capabilities and background noise elimination. Portable and professional Bluetooth speakerphone optimised for Skype for Business with HD audio, UC integration and Plug and Play Connectivity. Sennheiser SP 220 MS is a portable dual speakerphone solution that is certified for Skype for Business. Polycom RealPresence Trio 8500 is a revolutionary conference phone offering the industry’s most advanced sound quality - making every conversation, every spoken word just that much clearer. Yamaha YVC-1000 is a Bluetooth® enabled conference phone system for medium to large conference spaces that calls for flexible audio, web, or video conferencing. Desktop collaboration webcam with HD 1080p 90° video. HD 1080p video camera with enhanced pan/tilt and zoom. 4K UHD Webcam for truly amazing video quality with two omni-directional microphones and multiple connection types(USB 2.0, 3.0, Type C). HD 1080p 90° video and 360° sound meet portability and affordability. Includes the PTZ Pro 2 camera and duplex speakerphone with optional expansion mics available for larger rooms. HD 1080p 360° panoramic video with active speaker detection and Polycom’s legendary HD Voice technology. Logitech ConferenceCam Connect Camera and Speakerphone.